Let’s see an example how FastCut software saves your time by helping you to launch your favorite files, folders and websites faster. Suppose you want to open your favorite song located at ’D:/Songs/Fav/MJ/thriller.mp3′ Normally you would first double click ‘My Computer’ than after total of 12 clicks of browsing you’d be able to listen it.But with FastCut software all you have to do is drag and drop thriller.mp3 to Fastcut window and add it after that you can just launch it anytime by .. This just saved you 12 mouse clicks thus it’s clear how helpful the software is. This way you can save your time by adding your favorite files, folders and even websites as shortcut to Fastcut software. 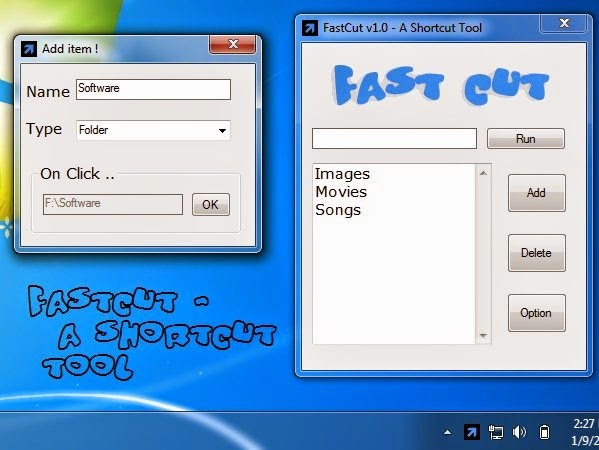 Yes, You can also use Fastcut as Windows Run Utility. All you have to do is press the keyboard shortcut key (by default – PageDown key) and then type the command you want to launch (e.g. notepad) and press Space key (or click Run button) and it’ll be launched ! 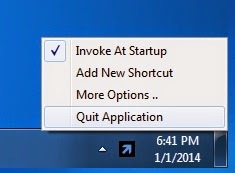 So Start Saving Your Time By Reducing Amount of Mouse clicks with this handy, light-weight FastCut Software.